Nearly 30 years ago, Thymes was founded by two friends with a mutual curiosity and a common desire to make something meaningful and beautiful. Thanks to a shared passion for creativity, botanical ingenuity, beauty and friendship, the business has flourished. Today, they are an independent company committed to artisan craftsmanship and dedicated to deepening connections through their love of fragrance — and, most of all, to creating fragrances that enrich the quality of your daily experience. 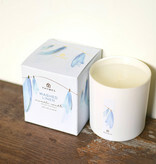 Thymes poured candles have non-metal wicks which provide a clean, pure burn time of approximately 56 hours. 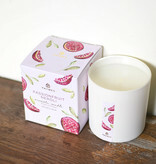 Pretty packaging and lovely spring scents make these candles perfect hostess, birthday, or whatever gifts. The clean, matte white vessel comes complete with a beautifully designed side label and carton. Light often to delight your senses and refresh your space. 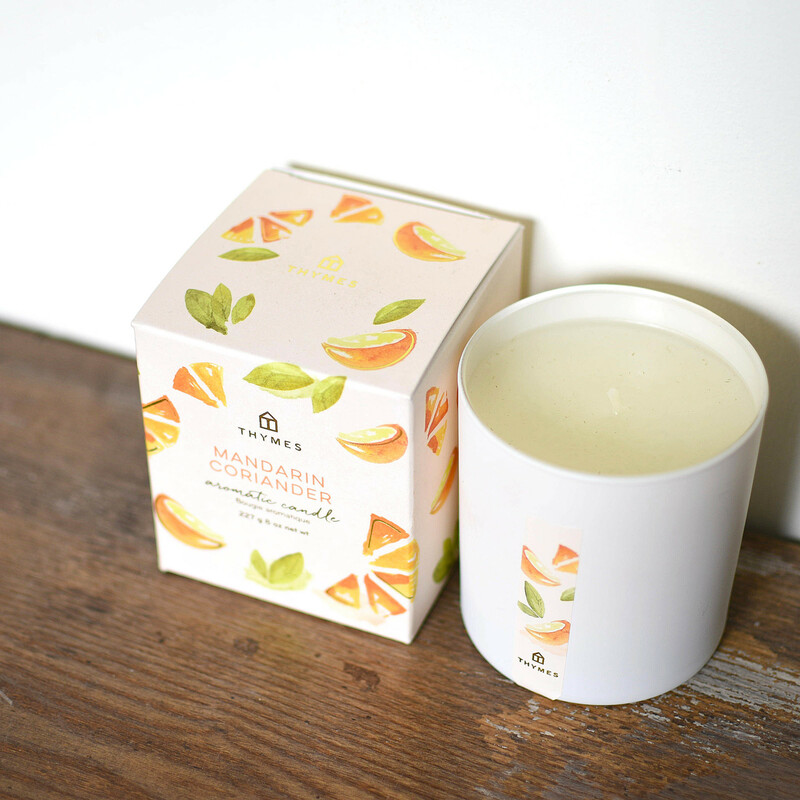 The crisp and clean mandarin coriander is an embossed white ceramic candle that combines cold-pressed mandarin oil, the essence of just-peeled oranges and the unique signature of coriander. This one-of-a-kind herbal and citrus blend is like a breath of fresh air. 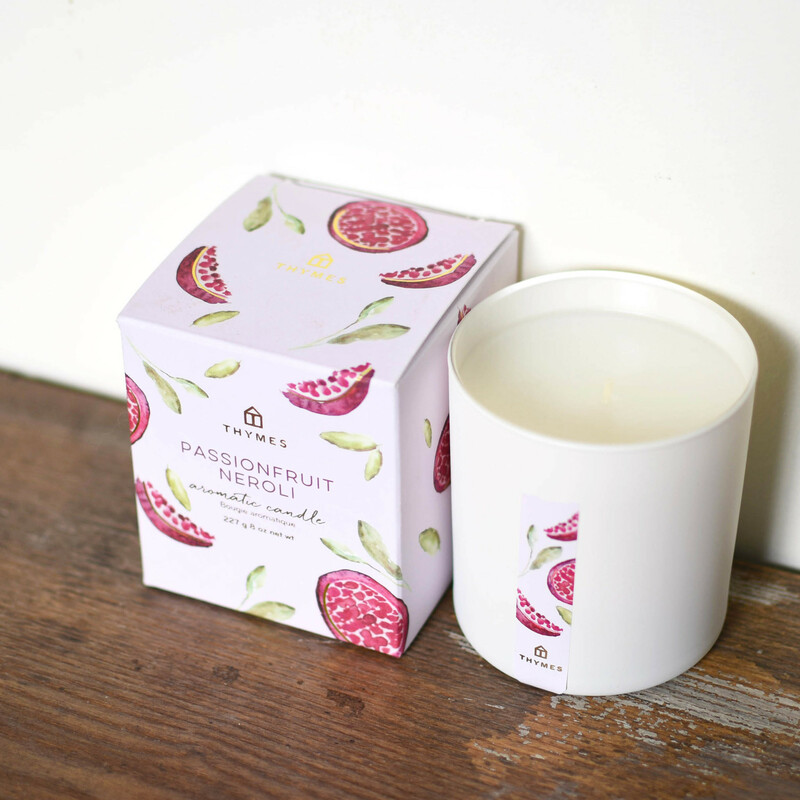 The aromatic passion fruit neroli is pink pomelo juice, passionfruit nectar and lush neroli combined harmoniously with white grapefruit, watery bamboo and jasmine milk, creating a burst of transformative energy. The senses awaken as this tropical and zesty fragrance lingers lightly. The greenness of fresh basil, tomato leaf, and delicate sage is touched with sweet notes of black currant, blood orange, and petitgrain. 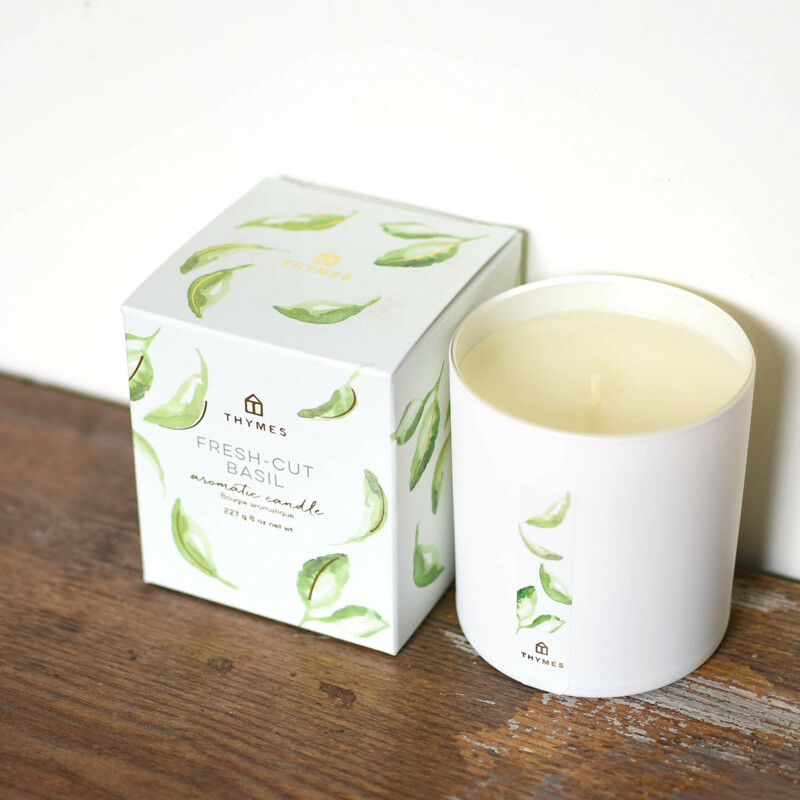 Clean and invigorating, the fresh-cut basil scent cultivates a backyard herb garden indoors in any season. Refreshing notes of fresh cedar wood, calming lavender and white pepper are rounded out with an intriguing touch of grapefruit, orange flower and amber. 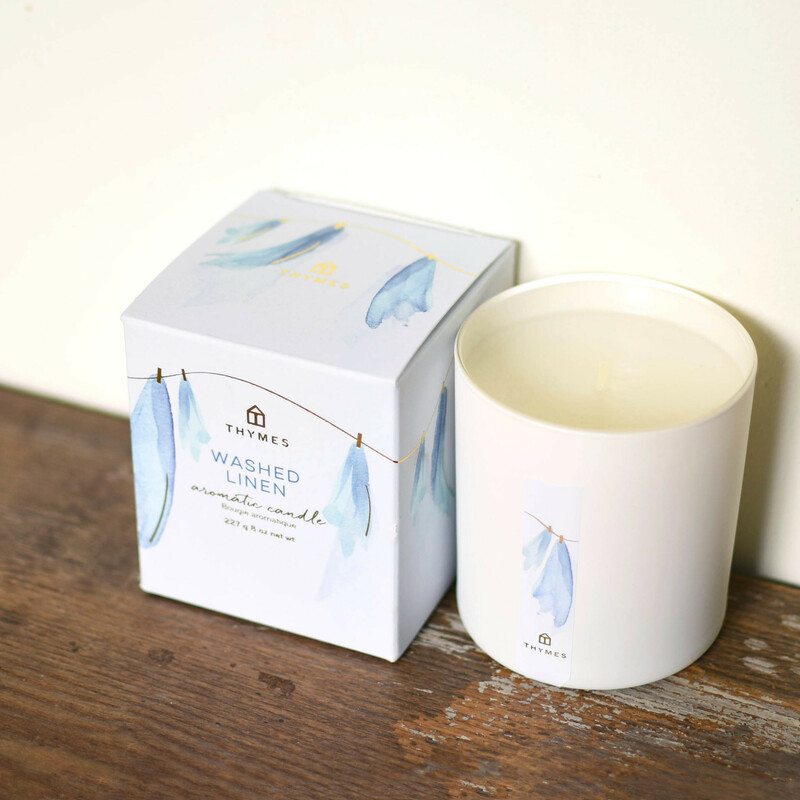 This irresistibly delicate and wooded scent of the washed linen candle is as inviting as freshly laundered sheets, dried with an outdoor breeze.